“I have been lying on job applications for 50 years and I finally wanted to be truthful on one of those things,” Shepler said, to a roar of laughs by the audience after the Technical College System of Georgia (TCSG) named him the winner at the 2018 Adult Education Fall Conference and GED® Awards in September. TCSG hosts the awards annually as a part of its conference for adult education and testing leadership statewide. Living in, “the middle of nowhere Vienna, Ga.,” as he put it, with seven dogs and his wife Dixie, is roughly a 40-minute drive to and from the Hawkinsville WDC where he took classes. As a career truck driver of 35 years and a part-time racehorse trainer, he is no stranger to long drives or the home stretch, so what became his biggest challenge to learning was actually algebra. Shepler is one of the eldest of the 41,704 students enrolled in adult education programs in TCSG’s 22 institutions for fiscal year 2017-2018, and the 10,613 GED® graduates. He said none of it would be possible without instructors like his own, Merissa Sands, who made math less of a mountain for him to climb. He also recognizes that at his age, 69 now, a GED® says more about self-honesty and personal betterment than career outlook. His advice to adults young and old considering a run at their GED® is to rely not on their fortune but fortitude. 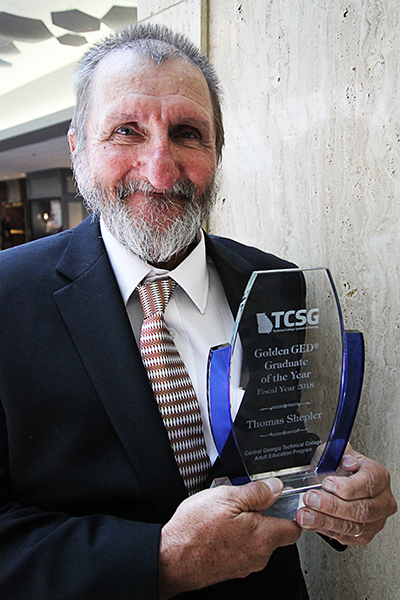 Shepler’s award is one of five TCSG awarded to the Adult Education Division at CGTC. For more information on the Adult Education Division contact, Dorothy Ferguson at dferguson@centralgatech.edu or call 478-218-3769. 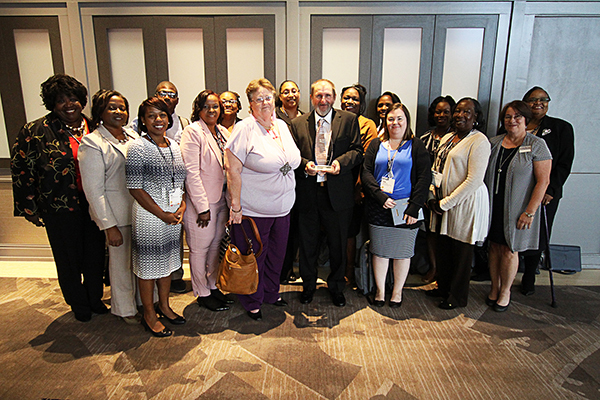 PHOTO 1: Members of CGTC’s Adult Education Division faculty and staff gather following the presentation of awards at TCSG’s 2018 Adult Education Fall Conference and GED® Awards in September. The Division took home five awards. PHOTO 2: The Technical College System of Georgia named Thomas Shepler, of Vienna Ga., one of its two 2018 Golden GED® Graduates of the Year during its 2018 Adult Education Fall Conference and GED® Awards in September. Shepler earned his GED® at 68. 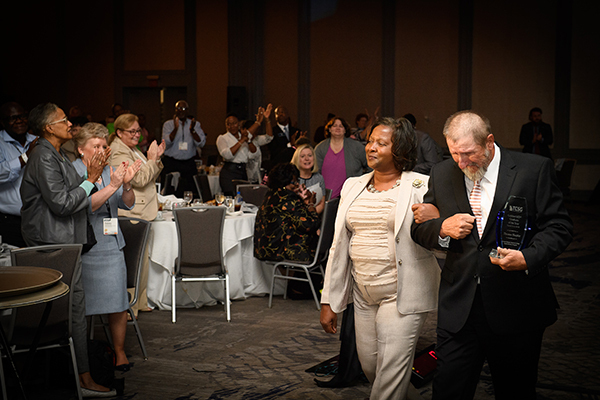 PHOTO 3: (Courtesy of TCSG) 2018 Golden GED® Graduate, Thomas Shepler, walks to a standing ovation with, Dorothy Ferguson, director of Operations for the College’s Adult Education Division, following his speech at the TCSG 2018 Adult Education Fall Conference and GED® Awards. This entry was posted in 2018 and tagged achievements, Adult Education, awards, Bibb County, Dorothy Ferguson, GED, graduates, Hawkinsville Workforce Development Center, Monroe County, TCSG. Bookmark the permalink.